This is a Class A Motorcoach Resort so you must meet that requirement to stay here. It's a beautiful resort on the main strip of Orange Beach next to Gulf Shores state park. It's very well maintained and the lazy river pool is gorgeous. This is an "owner" resort so you are renting an owned site thru an onsite property management company. It's gated and very secure. We rented site 108 which had a small private pool on our site. This was a really nice addition but the resort also has an awesome pool. People were friendly and welcoming. We were very close to the nice Gulf State Pier so we fished there a few times. Traffic in Orange Beach is heavy in the summer and they've installed U-turns and concrete medians to control traffic. I was not a fan of that. That was the worst part of our stay...getting through traffic! We had passes to park free at the Gulf SP beach lot provided by Buena Vista which was great. Area restaurants stayed really busy so long wait times everywhere. The Gulf Shores Walmart was very close if you cut through the state park. The state park is next door and you can access their many trails from the back of the Buena Vista Resort. BV loaned us bikes to ride. We have booked our 2019 stay already! 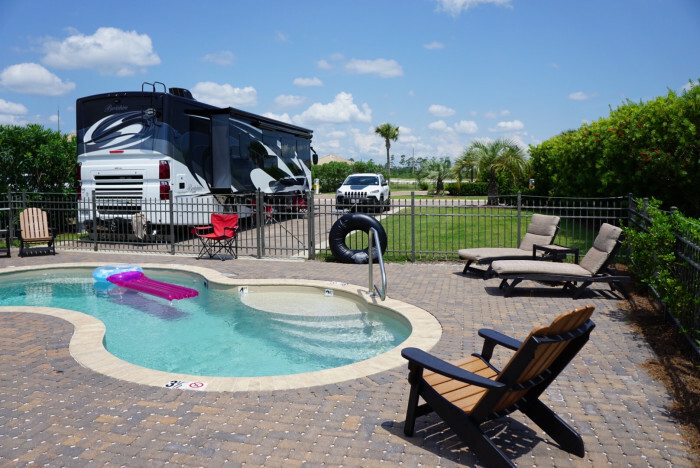 We camped at Buena Vista Coastal RV Resort in a Motorhome. Gulf State Park is next door. Their pier has great fishing and the pier is family friendly with restrooms, snack bar, bait store and cleaning station. Get your Alabama "pier" fishing license online before you get to the pier to save time. They had a computer/printer there but you have to login yourself and there's a line and little guidance for those who aren't as familiar with computers. There is a daily pier fee per person also. The trails in the state park are awesome too. We stayed just overnight while passing through. This was a nice overnight stop. It was easy to find. Staff was very nice and escorted us to a large pull thru site in a new section in the back. Nice pond and FHU's worked great. There was a train nearby occasionally but we got used to it. We will definitely stay here again if in this area. We camped at Lafayette KOA in a Motorhome. This is a very nice park which is located near many major attractions in the DFW area. Grapevine has so much to see and do including the downtown historic Main street area, Grapevine Mills mall, Legoland at Grapevine Mills, the Aquarium at Grapevine Mills, Bass Pro Shop and the Gaylord Hotel. The park was extremely clean and the staff was exceptionally nice. The camp store was well stocked and had any camping supplies you may need in a pinch. There was a security entrance with a gate that closed at 7 pm (code access after hours). Our concrete pad was level and spacious but we needed an extension on our sewer hose to reach the connection. We had a standard back-in space with a few trees around us. We felt it was a nicer space than many of the premium spaces just because it was not out in the open sun and offered more privacy. The spaces on the water are premium spaces but in the summer it would be extremely hot. We would stay in the standard spaces again. We did get some digital channels on the antenna which was great. The campground is situated on the edge of DFW airport so expect some noise. We viewed a satellite image of the campground to choose our space and that was very helpful in choosing a space with some tree coverage. We will definitely stay here again as it is a great base camp for all the area activities and the camp hosts were super nice. We camped at The Vineyards in a Travel Trailer. This is a nice state park that appears to have been updated recently. We stayed in a site with a lake view and had beautiful sunsets each night. We could walk right down to the lake from our site. It's rocky and hilly so you have to be careful but it is a clear path. The full hook-ups worked well. Our site was fairly level but we noticed sites further down the row tended to require a lot of leveling, especially for the larger trailers. Currently, there is a burn ban which includes a ban on charcoal grills. We forgot our small bottle of propane for our portable grill and had to go into Cleburne to buy more. Cleburne is about 18 miles away. We tried to buy propane earlier in the day in nearby Glen Rose as we had visited Fossil Rim, but it was sold out everywhere we stopped. With the burn ban, everyone has resorted to using the propane grills. There is no store at this park so make sure you have all supplies before you arrive. The park is 6 miles off the main road and Cleburne is the nearest town with major retailers. This park is remote so be prepared. The lake was nice for fishing though the water level is low due to the drought. This park is a good base location if you want to visit Fossil Rim or Dinosaur Valley National Park in Glen Rose. We will definitely visit this park again. We camped at Cleburne State Park in a Travel Trailer. This is a beautiful state park. The campsites are level with new pavement, nice hook-ups and lots of shade trees. There is a metal picnic table, tent pad, fire ring, lantern holder and concrete pad at each site. The shower/restroom facilities are clean and appear new. We got a good wireless signal on our laptop and our AT&T phone signal worked fine. We were in space 5 near the main bath/laundry building. For the kids, there is a small playground near the main bath, a walking trail that connects the campground area to the main office/diamond fields and a swimming pool area. There is no admission fee for the park but the diamond field and swimming pool have entrance fees. This park is very well maintained and the staff are very friendly and helpful. We had fun digging for diamonds and we took our own tools and a wagon. They do allow pets on leashes in the diamond field area. The town of Murfreesboro is nice but there is not much there other than a Sonic, a Dollar General, a small grocery store and a gas station. The nearest Wal-Mart is in Nashville, Arkansas which is about 17 miles away. We will definitely return to this park next summer. We camped at Crater of Diamonds State Park in a Motorhome. This is a nice resort park. The sites have level concrete pads, lighted pedestals and a decent amount of space in between lots. The trees aren't mature yet but they have planted several that are at least providing some shade which is better than none. We've stayed at this park three times and each time has been a great experience. The pools are nice and the RV lodge has games for the kids etc. It's a busy park on First Monday weekends and very quiet on other weekends. We've experienced both and they do a great job in both situations. They provide a dinner on Saturday night for First Monday weekends. It was barbecue during our stay and it was a nice added benefit. They charge more during these weekends so that probably helps cover the cost of providing dinner. We did not use the shuttle provided for First Monday but it ran about every half hour. We had a bad storm near us briefly and the park management drove through telling everyone to put down awnings and secure belongings because of high winds. They were very attentive and concerned about their guests. There are lots of activities to occupy the kids including paddle boats, fishing, pool activities, smores, movies etc. There is a $5 "resort" fee to cover the paddleboats. They also charge for the Wi-Fi so we didn't use it. The cable TV channels worked well. The shower facilities were very clean and well kept. We recommend this park to families who want a kid-friendly location with a lot of amenities. 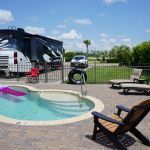 We camped at Mill Creek Ranch RV & Cottage Resort in a Travel Trailer. We stayed here the weekend after the 4th of July, just after the park had reopened on (July 1st) from their major renovation project. They have built new shower/restroom facilities in all the camping areas and have added full hook-ups to most of the RV campsites (including the Dogwood and Mountain View sites). Previously, the full hook-ups were only at the pull-through sites (Big Pine). Unfortunately, the newest full hookup sites are very short, so longer RVs will be difficult and next to impossible to accommodate. Keep in mind these were formerly tent campsites many years ago so you are parking an RV in what used to be the parking space for your car. These new full hookup sites are very sloped. Be prepared to use many leveling blocks. The shade trees are wonderful and the lots are spaced fairly far apart. We used the swimming beach and went to the new camp store. It has all been completely renovated. There are paddle boats and canoes for rent on the small lake. We could barely get an AT&T cell phone signal so forget about using an iPhone here. We enjoyed our stay and plan to visit this beautiful park again. I rated this a 9 due to the extremely sloped sites and limited space to park a tow vehicle. We camped at Daingerfield State Park in a Travel Trailer. This is a Jellystone RV Resort with all sorts of Yogi Bear themed activities for the kids. This is definitely a campground geared towards families and kids. We chose it for that reason and had a great stay. It's a large park so it can seem crowded at times. There are kids riding bikes in the streets but electric scooters and motorized ride-ons are banned so there weren't any kids zipping around on those. There are two pools and kids are allowed at both. We stayed in a space near the front pool so everything was easily accessible. There were mature shade trees on the lots closer to the front office area. The spaces were narrow overall. The shower facilities were very clean. The kids activities included meeting Yogi Bear, a hayride, riding their fire truck through the park, water balloon toss and a scavenger hunt just to name a few. The water park is still being built but should be done by next summer. There is a pond but no fishing yet from the nice dock they have built. It needs more water before it can be stocked. The location of the park was excellent. It's about 5 miles from a nice shopping area and Camping World is about 6 miles north. We are looking forward to going next summer and hope the water park is completed. We camped at North Texas Jellystone (formerly Rustic Creek Ranch) in a Travel Trailer.